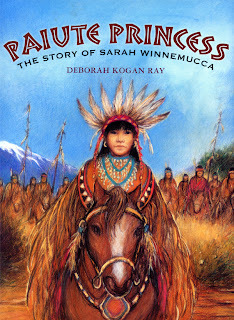 Recently, I had the pleasure of reading an early copy (an uncorrected proof, to be exact) of author/illustrator Deborah Kogan Ray’s newest picture book biography, Paiute Princess: The Story of Sarah Winnemucca, to be released by Farrar Straus Giroux/Frances Foster Books in May of this year. And though we’re a couple months away from the book’s release, I knew I wanted to use this opportunity to ask Deborah some questions about her research and her thoughts on the subject of the book, a nineteenth-century member of the Northern Paiute tribe of Nevada, who very much existed in both the traditional world of her people as a child but then the world of white settlers as an adult. (The white men called her “Princess Sarah.”) Sarah became a controversial educator and activist, traveling the U.S. to lecture about the travails of the Paiute people, and she became the first Native American woman to publish a book in English (1883). I thank Deborah for taking the time to answer some questions about this upcoming release. Jules: Sarah Winnemucca is someone whose story isn't often told in history texts. What made you want to tell her story? 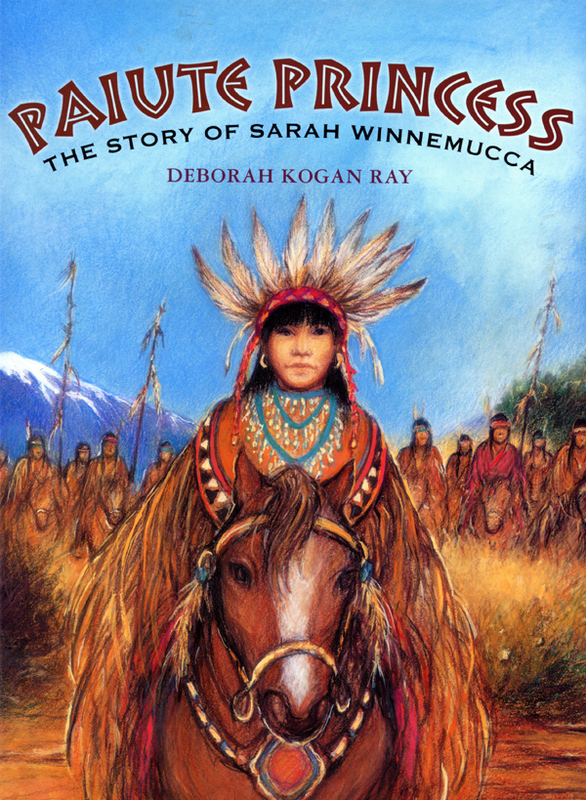 Deborah: I ‘discovered’ Sarah Winnemucca when I was doing research for a book that I was illustrating about the Oregon Trail. An anthology that I was using for reference, Women of the West, included a short bio about her role as a crusader for her people’s rights and a few quotes from her book Life Among the Paiutes – the first autobiography written by a Native American woman. At the time, I thought, what a remarkable woman – we should all know more about her. But other books and projects intervened – for 20 years. I’ve always said my subjects for biographies find me. And some ideas don’t go away. When I finally read Sarah Winnemucca’s autobiography in its entirety, I knew I wanted to tell her story for children. The story of the west has historically been told from the white, and usually male, point of view. Few native women are recognized for their roles in our country’s history. Among them, Sarah is unique. Pocahontas and Sacagawea both lived in times and places where the white man was a powerless stranger in a strange land, dependent on their help for survival. Sarah Winnemucca, by contrast, faced a world where the fate of the native people was in the hands of the new rulers of the land. Life Among the Paiutes remains an important document, as both an autobiography and a history of events seen through eyes of a native woman. Sarah Winnemucca’s story is one that children should know. Jules: Tell me about your research for this book. Deborah: In one word: endless. I began writing and researching in early 2008, and we were still copyediting the material until the book went to press in late 2011. 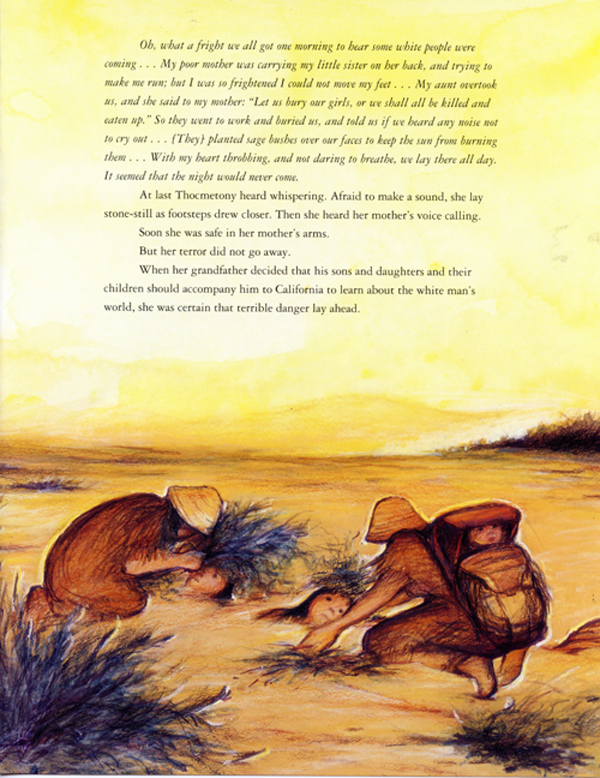 In the book I use Sarah’s words and point of view to tell the story with an accompanying narrative for description of historical events. Using autobiography as story basis is a balancing act---most of us try to present ourselves in the best way possible---and Sarah’s book was intended to convince people of the justice of her cause. Plus, it was written from memory. Everything had to be checked and double-checked for accuracy. My wonderful, ever patient editor, Frances Foster, was inundated by paper. As was I: My office overflowed with clippings from ancient newspaper files about Sarah (as despicable and demeaning as anything you can imagine), copies of her letters, my notes from interviews: plus maps, photos, reference books, pictorial documentation, etc. In a time when copyediting has too often become casual, the FSG copy editors demand proof of everything from several sources! 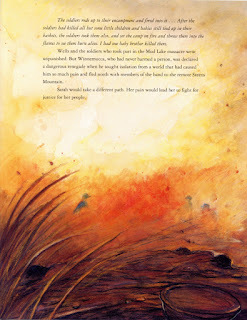 Jules: There are very intense moments in Sarah's life story---such as, being buried in the dirt as a child with a sage bush covering her face in order to escape white men, as well as the surprise 1865 attack at Mud Lake, where people were burned alive---which you convey so honestly in this biography. Were these moments challenging to render via your paintbrush? Deborah: How to deal with painful imagery is always a challenge. Because Sarah’s descriptions of the events are so powerful and situations so frightening, as the illustrator I chose to draw back -- rather than graphically show the horror. 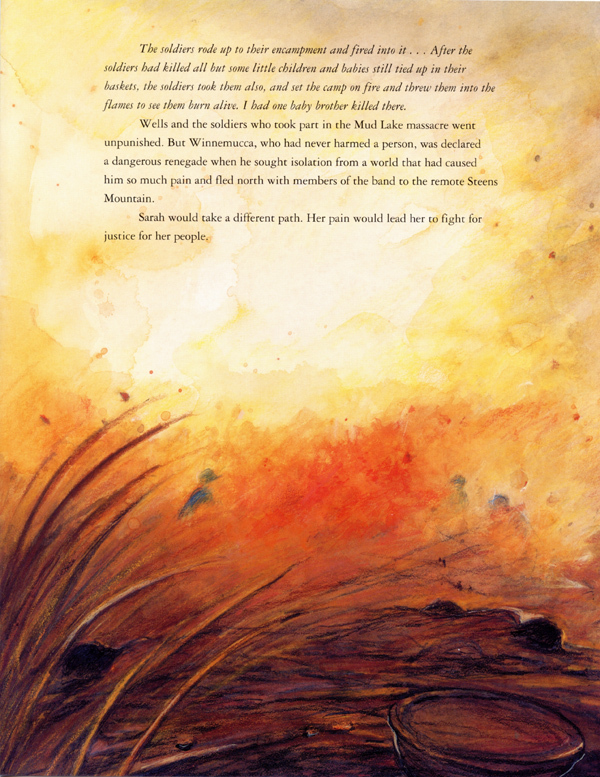 In the illustration of Sarah’s burial I chose to use both color (the yellow burning sun sky) and the figures of Sarah’s aunt and mother bent over the helpless girls as they bury them. The women’s physical gestures convey their panic. Though seen from behind, we know that they are literally clawing the sand. For the massacre scene, we know from the text that they are throwing babies in fire, but I don’t show them. I use shapes and color. Dark shapes of barely discernible bodies and baskets in the foreground: the red raging fire with soldiers seen through the toxic looking smoke. I want the reader/viewer to absorb the situation through his/her own skin. Jules: What did you learn about Sarah, while researching, that most surprised you? Deborah: As a biographer, one has to get to know every aspect of their character – the good and bad, the serious and humorous. Without the nuance, you have a cardboard figure. There were many surprising things about Sarah, starting with her incredible use of language, both written and spoken. Besides being a passionate advocate, she had really wicked tongue, and great sense humor. She was also a show woman, whether on the stage or on the parade ground of a fort. I read several accounts of her dramatic displays of her skills as a horsewoman: riding sidesaddle, dressed to kill in fancy riding habits that she created, wowing the infatuated young officers. 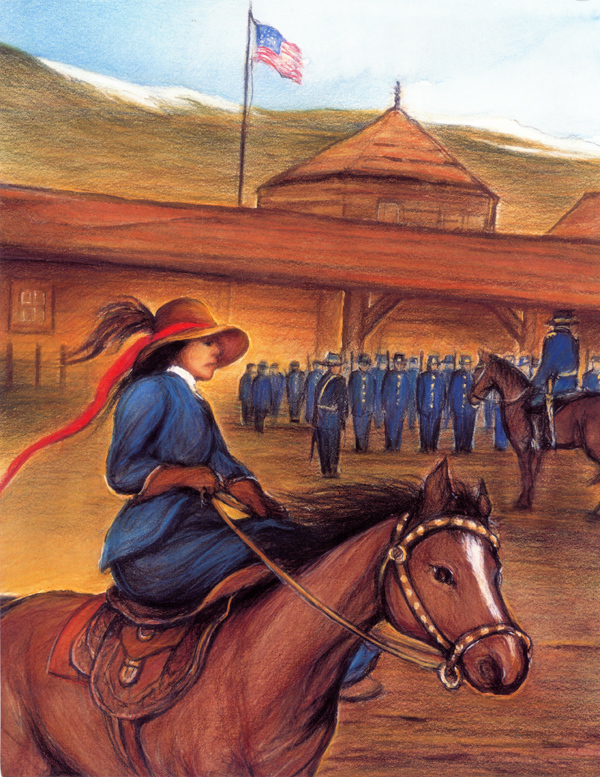 It was such a great image that, though I don’t mention the information in the book, I used the description for my illustration of when she was at Camp McDermitt. Jules: What's next for you? Working on any books now you can tell me about? Deborah: Right now my energy is focused on making sure people hear about Paiute Princess. That will be released in May. I have several proposals that I am working on, plus a couple that are out at publishers for consideration. These are not golden days for non-fiction. School budgets have been cut. No one knows what will happen with bookstore sales or e-books. There is great fear from publishers about taking “chances.” Hopefully, things will change for the better…. My truly exciting news is [that] I’ve finally cleaned up my studio and office: the surfaces are ‘practically’ pristine since the staggering piles of “Sarah-bilia” were boxed and put away! PAIUTE PRINCESS: THE STORY OF SARAH WINNEMUCCA. Copyright © 2012 by Deborah Kogan Ray. Published by Farrar, Straus and Giroux / Frances Foster Books, New York. All images posted with permission of Deborah Kogan Ray. Editor's Note: Julie Danielson received her Master's degree in Information Sciences at The University of Tennessee in the U.S. She writes articles on children’s books and interviews their creators for Seven Impossible Things Before Breakfast, a blog that focuses primarily on illustration and picture books. 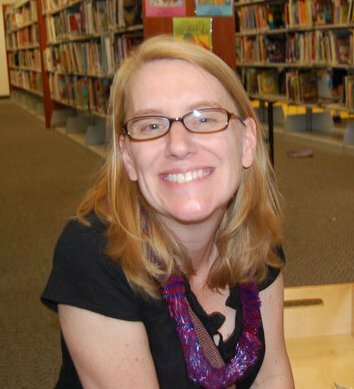 She also writes a weekly column on children’s literature for Kirkus Reviews and is currently working on a book with Elizabeth Bird and Peter D. Sieruta. Tentatively titled Wild Things! : The True, Untold Stories Behind the Most Beloved Children’s Books and Their Creators, it will be published by Candlewick Press in 2013. In 2011, she served as a jury member for the Society of Illustrators' Original Art award, and just this year she juried for the Bologna Children's Book Fair Ragazzi Awards. Her website is sevenimpossiblethings.org. Thanks so much for a fascinating post! I'm really looking forward to reading this one. It's so true--the only Native American Women that most kids know about are Pocohantas (and then mostly the Disney version!) and Sacagawea, so it's great to learn about this resource. Thanks for the "heads up" on Paiute Princess. I'm sure that many will have it on their "must buy" list. I look forward to seeing it in print soon. Thanks, Jules, and best wishes, Deborah. Wow! Looks like a gorgeous book and an inspiring story! I will have to check it out when it is released. Great idea for a story. The illustrations are simply beautiful. Such a boost for libraries - out in the world & at home - to have this helpful head's up. The story of her life is breath-taking. And I salute Deborah Kogan Ray for handling the challenging details. I look forward to reading this biography in words & to appreciating the art on the page about Winnemucca & her people. I am always in awe of great authors who are also great illustrators. Thanks, Julie. I'm also eagerly awaiting "Wild Things!" Apparently you need to go back and get the truth on Sarah Winnemucca. I would start with talking to a paiute elder, and not rely on a europeans version "his-story" of her and what she did too her people. This Hollywood version does no justice to true historical accuracy, this i know because I am paiute and know our history more than some european would have glamorized it.